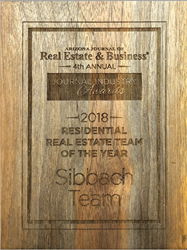 Top Reporting Source Arizona Journal of Real Estate & Business names Sibbach Team 2018 Residential Real Estate Team of The Year. The Sibbach Team at Realty One Group was named the “2018 Residential Real Estate Team of the Year” by the Arizona Journal of Real Estate & Business. This local Arizona award comes on the heels of the team being nominated for the national award by Inman.com a leading real estate news source as the Most Innovative Real Estate Team in America. "It's been an exciting week that our hard work and dedication to advising clients is being recognized", comments team leader Jeff Sibbach. The Top Real Estate Team of the Year voted by an esteemed panel of judges consisting of industry leaders and icons. The award is given to a team that not only impacts the industry with results, trends, and business leadership, but that also finds ways to give back and impact the local community. It was the Sibbach Team’s unmatched results, closing 175 million dollars in real estate transactions in 2017, as well as their commitment to the community with their “Sibbach Cares” event that made the Sibbach Team a shoe in for the award.